Global Resort Homes wins CFVRMA Property Management Company of the Year. Pictured: Robyn and Guy Bouchard. 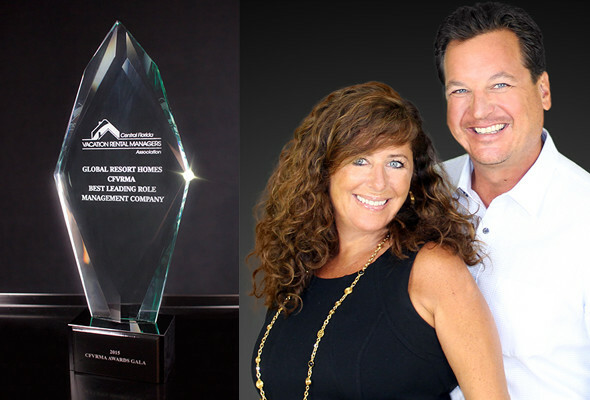 Global Resort Homes, a leader in the vacation rental home industry with over 23 years of experience, is pleased to announce our win for Property Management Company of the Year presented by the Central Florida Vacation Rental Managers Association (CFVRMA) at the 2015 VRM Gala that was held November 7th at Westgate Vacation Villas in Kissimmee, Florida. Since 1993, Global Resort Homes has continued to grow and evolve with the changing times. Today, we strive to be at the forefront of the vacation home industry in both vacation home rentals and real estate sales.